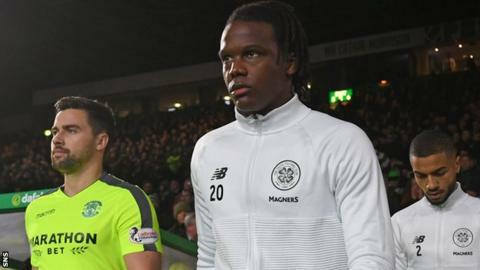 Neil Lennon has not given up hope of convincing defender Dedryck Boyata to sign a new Celtic contract despite reports linking him with Hertha Berlin. Lennon said he is "not aware" of rumours that the Belgian had agreed a deal with the Bundesliga side. The Celtic manager says Boyata deciding to stay would be "great for everyone". "I wouldn't be surprised if there is interest in him, but we are still hopeful that we can persuade him to stay," said Lennon. Boyata signed a four-year deal with Celtic in June 2015 after failing to make the grade at Manchester City. How close are Celtic to treble-treble? Lennon said he was "pleased with the overall performance but not the scoreline" as his side were held to a goalless draw at home to Livingston. It means Celtic will need to wait until after the Scottish Premiership split to secure the title. Odsonne Edouard, James Forrest and Tom Rogic were all denied by in-form goalkeeper Liam Kelly, while substitute Oliver Burke fired wide from close range late on. "We missed our killer touch, but the players kept going," Lennon told BBC Scotland. "Ultimately, we didn't get the win we wanted. "I'm disappointed we didn't have enough clear-cut chances. But we can take a lot of positives and we're looking forward to the cup semi-final [against Aberdeen] next weekend."